New rules on anti-money laundering could create an unprecedented central registry of European businesses’ real owners before 2018 after being agreed on by the European Council and endorsed by the European Parliament. The fourth directive on anti-money laundering (AMLD4) – to stop terrorist financing and reduce tax crime – gives member states two years to complete a register of the ultimate or ‘beneficial’ owners of legal entities within their countries, including corporations and trusts. The register will be accessible by authorities and their financial intelligence units ‘without restriction’. Other ‘obliged entities’ who will be granted access to the register include journalists who can prove a legitimate interest in the information they are seeking and banks who require such information to complete due diligence obligations on customers. Legitimate interest is described by the European Parliament as suspected money laundering, terrorist financing and ‘predicate’ offences that may help to finance terrorism including tax crimes, corruption and fraud. Public access to the registries will also be available subject to an online registration by the person applying for the information, and payment of a nominal administrative fee. The company information available through the registry will include the beneficial owner’s name and date of birth, their nationality and country of residence and details of the ownership, without exemptions, save for ‘exceptional circumstances’. However, details on trusts will only be available to authorities and obliged entities. 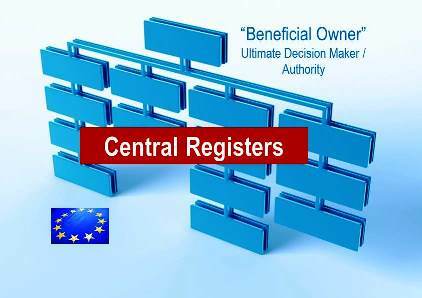 Britain pledged to create publicly accessible company registers in October 2013, making it the first country to commit to an obligatory public register. Banks, law firms, auditors, casinos and property agencies will also be expected to meet new reporting obligations under the directive, to alert authorities to suspicious transactions by their clients. And special measures will be implemented for politically-exposed persons (PEPs) who are deemed to be at a higher risk of corruption because of the positions they hold. For such individuals – including members of parliament and government, heads of state, Supreme Court judges and their families – the directive says additional measures should be put in place to establish sources of wealth, particularly within high-risk business relationships with PEPs. Another regulation, voted in by Members of the European Parliament, involves rules surrounding ‘transfers of funds’ and aims to better record payers and payees’ assets as they move funds through the payment chain. This rule could take effect across all European member states as soon as July this year. Analysts say AMLD4 shows the European Parliament is clearly backing a public beneficial ownership register to break with the tradition of disguised company ownership. Crime and corruption is often cited by G8 members as a hindrance to their promotion of global stability and economic growth as they encourage other countries, especially in the developing world, to meet AML/CFT requirements. According to the UN, money laundering via the financial system represented $1.6tn – around 3 per cent of GDP – in 2009. This story is provided by Worldbox Business Intelligence. BIIA Editorial Comment: Why would one need a special register? Owners of businesses and those holding proxies must be registered by law. Thus business registers already contain the required information. Nevertheless in the absence of small business registers it would be advisable to extend the filing requirements using existing business registers rather than creating new ones. BIIA had asked these questions in a previous post. The other question is why restricting access to the data? Business registers have been created to provide transparency. Preventing access to such information to the general public, grantors of trade credit and credit information businesses is counterproductive.